Why do you choose Hebei Shengri? Factory: Hebei Shengri can do the best control for the production cost, product's quality and as Profession manufacturer in ground screw Industry. Service: Hebei Shengri can do the best service which credit to 20 year's full export experience and top-quality sales team. Quality: Hebei Shengri products follow up Krinner's production standard, the products enjoy a good reputation around all of the world. Technology: Hebei Shengri can offer customer the best design proposal with the supports from top-quality engineers and R&D teams. Professional: we are the biggest manufacturer for making ground screw in China and we have produced ground screw for many years. Any interested and more information, feel free to contact me. Waiting for your news. Sophia! 1. 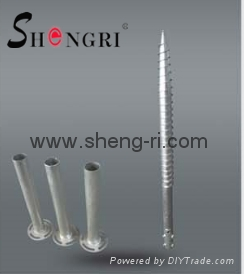 We, Hebei Shengri Import & Export Co., Ltd. Is a professional manufacturer and supplier of ground screw which are applied to foundation of solar power, wooden cabin, building, base of advertising board, etc. Our factory has forging workshop, welding workshop, pressing workshop. Thanks to diligent workers and automatic machines, we possess capacity of 1,500,000 pcs ground screws annually. 4. Be approved by LGA in Germany.